World Premiere: 10 avril 2010, Pays-Bas, Amsterdam, Concertgebouw, par le chœur et l’orchestre de la Radio néerlandaise, direction : Marin Alsop. 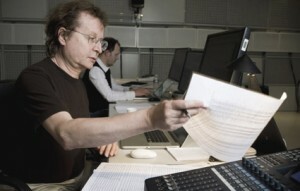 Tristan Murail worked back on a previous piece to supersize it. We completed the real 40 singers choir with a virtual choir . To do so, I developed a virtual choir synthesizer able to generate a whole choir from only one solo recorded voice. We used OpenMusic software to control the advanced phase vocoder SuperVP, so as to synthesize some little score snapshots written by Tristan Murail. The main goal of this development was to go beyond the limits of a real choir. Here are some examples that must be thought as a part of a global choir. For each voice, and to create a choir effect, “human variations” have been implemented as modulations of the original score. Here is another example with a complete melody phrase.